We welcome your feedback. To add your own comments, please use our contact form located here. The Chadwick laurel oval table and our Brighton chairs were delivered Monday. I cannot tell you how pleased my husband and I are with this set! He is enamored with the weight and solid construction. We looked around quite a bit prior to purchasing from your company, and we could not be more pleased. This set cost half of what we almost paid at the Pacific Design Center. I will definitely pass on your catalog to our designer. You guys are terrific. I have one word for our new estate table: WOW. We haven't seen one like this anywhere else. Thank you for the input with the rest of our order. Everything looks perfect and the party was a big success. I kid you not that our neighbor at the beach house thought we paid over $5,000 for the table! We had a good laugh. I recieved the oxford lounger yesterday. I am very pleased. I appreciate the great service and quality product. I love our new deep seating loveseat and chairs. We are using them indoors until the summer. But they look so good inside that I'm thinking we ought to purchase a different set for outdoors. We'll be back for more. Thanks for your help. Our family reunion was a big success. We appreciate your efforts to get all the chairs and benches here so fast. They looked sensational in our pool area. We have the loungers and storage box we bought from Colton Teak last year there as well. We've become big teak fans I guess. It just all looks so good together. We made the mistake of buying from [redacted] in the past. Their teak is nice too but costs so much more. This dining set is really good looking. Had friends over last night and I think you will have a few new customers! Everyone thought we paid a lot more than we did. The Jennings family thanks you for your assistance and fine bench during this difficult time. We will cherish it for years and remember our Dad. The plaque was perfect. Got everything yesterday. Looks great. Your service really impressed us. Thanks for the personalized communication. Difficult to find these days. We will be back next year when we finish the second deck to our summer house. The Colton ergonomic chairs were just what we were looking for. Truly feel good to sit in but yet aren't too traditional. We are pleasantly surprised at how sturdy and beautiful everything is. My sister is an interior designer and flipped over the Marble Estate Table. Steamers arrived last week - faster than we even expected. Boxes looked like Federal Express used them for punching bags - but not a scratch on the loungers. Good packing job. My son-in-law said he is impressed with the quality of the teak. He shopped around with us before we bought. We almost bought a more expensive set. This looks better!!! We're stunned. Usually you get what you pay for. We will recommend you highly. I received the patio set today. Thank you for all your good service and help on the phone figuring out what I needed for my space. It fits perfect and looks beautiful. And I appreciate the free coconut chopsticks. I'll use them soon. It is a wonderful surprise. All we have to say is a big THANKS! My wife and I were really nervous about purchasing an entire patio set and lounge chairs online without seeing and feeling it for ourselves first. We had bought from another site once before and did not think the quality was that good. As I mentioned on the phone, we just could not be more satisfied. Arrived ahead of schedule and this teak is gorgeous. To be honest, our only suggestion (now that we have already bought what we need!) is for you to consider raising prices a bit. We thought the teak would not be solid and high quality because you were so affordable, and were so pleasantly surprised to see and feel the same construction and quality we see at our local patio stores for three times as much like Smith Hawken and Brown Jordan. Thanks again! Love the garden bench we purchased last year. Glad to see you added this section to the site because we are happy to give our input. Really the best deal on the web for the bar none high quality at great prices. The Rock is decorating his new house in Brentwood himself and the new black palm vase was a perfict fit. I'm certain he will be back to your store for more. Thank you. We pride ourselves on unparalleled satisfaction for our guests. Your stunning teak peanut benches, chairs & bistro tables grace our front deck facing the ocean in Santa Monica and the guests enjoy them immensely. The deck chairs are perfect for our boat. Thank you. You are right, these are comfortable without cushions. We will be back for sure. We unpacked the set and market umbrella yesterday. They are stunning and the chairs are as comfortable as you said. As we finish the deck, we will need more so you will be hearing from us soon. If you ever need a referral, let us know. Your staff has been really great with all of our requests and everything worked out perfect. Thank you for recommending the Brighton Teak Chaise Lounges. They are just right for us. Look even much better in person than in your pictures. We will send you some from our pool area so maybe you can use them! This is really nice teak!!!! Thank you for the great deal and help with figuring out customs and such for shipping to Canada. We will recommend you to friends and family. Great furniture and even better prices. I am kind of obsessive about finding just the right pieces for our newly remodeled house. Was prepared to pay a lot more for our garden furniture but then Mary recommended your company to us and we are so glad we did. 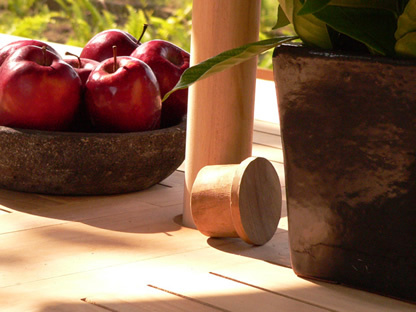 You are not kidding that you have the best prices for really nice teak. My husband knows a thing or two about construction and gives it two thumbs up. Colton Teak welcomes your comments and feedback. We recently added this page at a client's suggestion and hope to continue to add to it with feedback from both old and new clients alike. Click here to do so.